The Wave Books Poetry Bus Tour will be stopping in Lincoln Monday Sept. 11th. 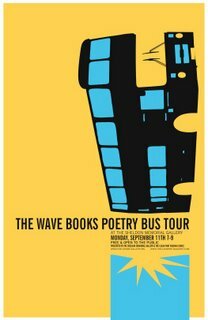 Stopping at 50 cities in 50 days, the Wave Books Poetry Bus Tour is the biggest literary event of 2006. Beginning September 4 and ending October 27, over one hundred poets, along with musicians, filmmakers and journalists, will participate as the bus traverses North America, bringing innovative poetry to big cities and small towns across the U.S. and Canada. Sponsored by Wave Books, the poetry bus will go more places with more poets reading more poems than was ever previously believed possible. Touring poets Joshua Beckman, Matthew Zapruder, Anthony McCann, Erin Belieu, Joshua Marie Wilkinson & Anselm Berrigan are teaming up with local poets Michael Dumanis, Grace Bauer, Zachary Schomburg & Mathias Svalina to bring you a night of fun-filled poetry antics. In addition to the Sheldon the tour's venues include: The Space Needle in Seattle, WA; The Naval Academy in Annapolis, MD; The Walker Arts Center in Minneapolis, MN; The Bama Theater in Tuscaloosa, AL; James Turrell’s Roden Crater in AZ; Dia:Beacon in Beacon, NY; Dia Art Foundation in New York, NY; as well as bookstores, galleries, clubs, prisons and schools across the continent. Participating poets throughout the entire tour include: Eileen Myles, James Tate, Cole Swensen, Dean Young, Joshua Beckman, Noelle Kocot, Matthew Zapruder, Tyehimba Jess, Hoa Nguyen, Richard Siken, Katy Lederer, Dara Wier, Arthur Sze, Catherine Wagner, Srikanth Reddy, Matthew Rohrer, Thomas Sayers Ellis, Bhanu Kapil and over 100 more.